Located between the Sea of ​​Cortez and the Sonoran Desert, it is a destination that has a unique natural wealth. Here you will find high level tourist complexes, exclusive golf courses, high quality services, gourmet restaurants and countless opportunities for water activities; but, above all, you will approach a warm community of fishing origin with a great vocation for service. Being an area of ​​free access from the United States, it is very visited by inhabitants of Arizona. A natural site declared a World Heritage Site by UNESCO since 2013. It has the largest active dune field in North America and a spectacular volcanic shield where lava flows, cineritic cones and giant craters converge. Also known as “Tijuanitas”, this famous and old port road houses a wide range of commercial establishments, mostly Mexican and international food, as well as bars and ice cream shops. Newly remodeled, it is a meeting place for its inhabitants and tourists. It houses an important part of the gastronomic offer of the port, as well as places dedicated to the sale of handicrafts and local products. Attractions: Luis Donaldo Colosio Square, monument to the shrimper. It is already a Rocky Point tradition to contemplate this pirate ship crossing the bay every afternoon, throughout the year. The iconic boat offers music, dance, food and lots of fun on board for the visitor and the locals. Every November and lasting four days, participants and spectators from the United States, Canada and Mexico meet at the most important motorcycling event in the region. Literally, the city is full of bikers. It is considered one of the main reproduction areas for sea lions in Mexico. There are tour operators that offer guided tours in Rocky Point. The island is located one hour south of the city’s coast. To the west of the city, a rocky peninsula shelters a picturesque village at the foot of its monumental hill. The place adjoins a gigantic estuary where it is possible to see and interact with its beautiful aquatic life. It is a didactic space that offers information on the behavior of different marine ecosystems. It shelters sea turtles, manta rays and other species, some of which are endemic to the Gulf of California. 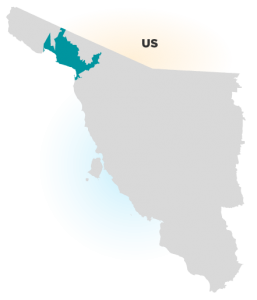 The Intercultural Center for the Study of Deserts and Oceans is a non-profit organization dedicated to investigating the Sonoran desert and the northern Gulf of California, as well as conserving natural resources. It is a racetrack designed for all-terrain vehicles. Here important competitions are carried out. It is located 5 kilometers north of the city, on the road that leads to Sonoyta. Few people imagine that Rocky Point is a wonderful destination to play golf. The port city has three beautiful fields (two designed by Jack Nicklaus himself) surrounded by the Sonoran Desert and the Sea of Cortez. Whether they are hunchbacked or gray, the world’s largest mammals travel thousands of kilometers during the winter to reach the warm waters of the Sea of Cortés and settle during the months of January to March. The waters of the port represent a good opportunity to carry out an incredible fishing. Within the great diversity of species allowed for the activity, the most popular are sierra, cochito, curbina, cabrilla and botete. Enjoy the taste of fresh oysters and live the experience of extracting them on your own in one of the three farms located 7 km from Puerto Peñasco, all recognized worldwide for the quality of the product.